RSS worker hacked to death by alleged CPM goons in Kerala. Hindu activist of RSS hacked to death in Kerala’s Guruvayur. Bandh Called in Temple Town on Monday. Anandan hacked to death by Communist goons in Kerala. B Upendran | HENB | Thiruvananthapuram | Nov 12, 2017:: A RSS worker was hacked to death, allegedly by CPM workers with the help of Jihadis at Nenmeni in the temple town this afternoon, as reports came in. The victim, Anandan, (26), was riding a motorcycle when he was attacked by the CPM workers in a car. Though he was rushed to hospital, his life could not be saved, police said. Haindava Keralam a Hindu News-Views portal reports from Thrissur: Yet another RSS Karyakarta succumbs to the violent Communists- Jihadi nexus. Anand, native of Nenmenikkara was hacked to death by a gang of Communist hoodlums in the afternoon, after being chased by them. Responding to the crime, BJP state president Kummanam Rajasekharan has flayed the Marxists for still adhering to their violent stand. A hartal has been called for in Guruvayur on Monday. 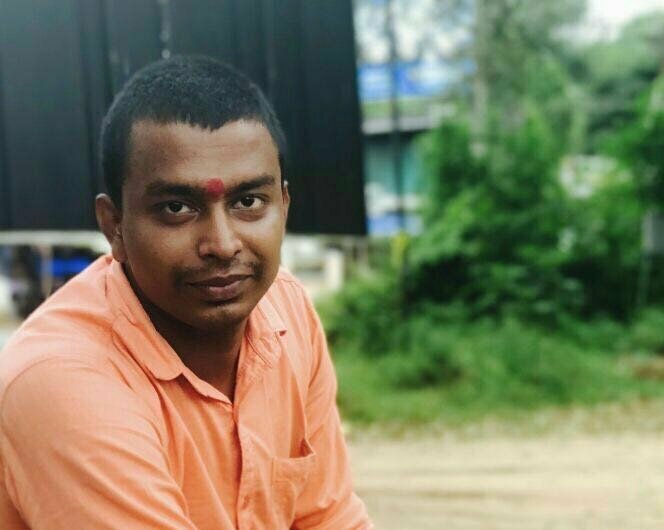 I condemn the brutal killing of a young RSS Swayamsevak K Anand in Guruvayur,Kerala. The continuous violence by CPM workers & the protection to such political killings is now before the nation. CM Pinarayi must explain what his govt is doing to curb criminal elements in his rank. #LeftistTerror bloodshed continues in Kerala.BJP Karyakartha Anand murdered brutally in Guruvayur, Thrissur.Communist terror surging in the state with #JungleRajInKerala to aid. .___inputs from PTI and HK. The Communists in Kerala are engaged in a process of cleansing of Hindu activists there. They want to make Kerala as a state of Communists, Muslims and Christians. Not for Hindus. (Moderator for HENB in PR Cell). This entry was posted on November 12, 2017 by hinduexistence in Anti-Hindu, Attack on Hindus in India, Attack upon Hindus, Attack upon Hindus by Marxists, Breaking India by Communists, Communist Menace, Communist Terrorism, Communist Terrorism in Kerala, Conspiracy against Hindus, Hindu Murder, Hindus under Attack, Save Hindus in Kerala, Save Kerala from Communist Menace, Stop Hindu Murder in Kerala and tagged ABVP calls for sending Central delegation to Kerala, Anandan hacked to death by Communist goons in Kerala, Anandan Murder, Guruvayur Murder, Hindu activist hacked to death, RSS worker hacked to death, RSS worker hacked to death by alleged by CPM goons.